Lt. Gov. 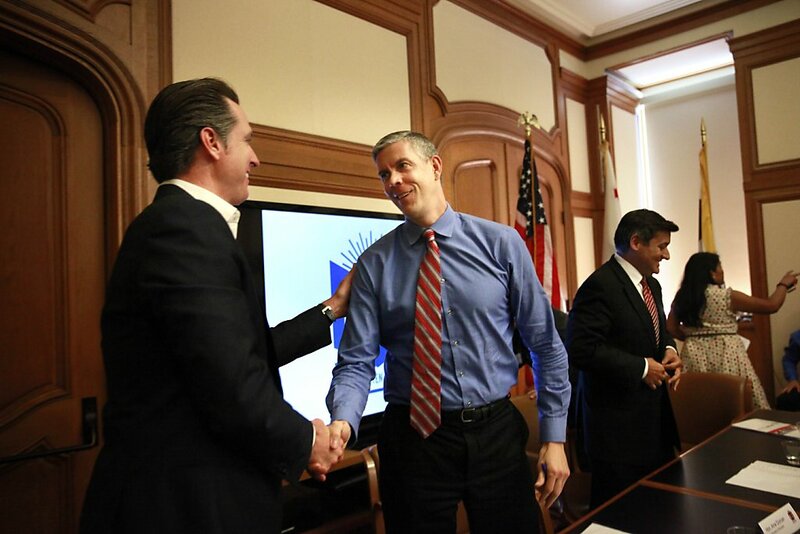 Gavin Newsom (left), who as S.F. mayor instituted the Kindergarten to College program, greets U.S. Secretary of Education Arne Duncan after a roundtable discussion. Secretary of Education Arne Duncan was on hand Friday as Mayor Ed Lee announced a milestone in the city's Kindergarten to College savings program to a packed room at City Hall. The program, which establishes a college savings account for every kindergarten student enrolled in San Francisco public schools, has created roughly 8,000 accounts since it began almost three years ago. Families have invested more than $310,000 of their own money in more than 1,000 of those accounts, the mayor said. "The key is to have the city commit to every single child," Lee said. "This can transform whole communities, and that's what we want to do." The city's college savings program is the type of effort that the nation should be looking at, Duncan said. "This is one of the more unique, innovative, creative ideas," Duncan said. "Kids start thinking about college in their junior or senior years of high school, but by then it's too late." A panel discussion, also attended by Lt. Gov. Gavin Newsom and San Francisco Unified School District Superintendent Richard Carranza among others, focused mostly on the success of the program in San Francisco and how it could be replicated on a wider scale. The savings accounts, established in the students' names, start with an initial deposit of $50 provided by the city, which can be doubled if the student is enrolled in the free school lunch program. The city will also match the first $100 deposited by parents in the first year. Additional opportunities for matching funds are available, as well as for parents who sign up for a minimum direct deposit. Much of the program's success is owed to the fact that the accounts are created automatically, said Doug Vasquez, whose daughter, Mia, will be entering second grade at Junipero Serra Elementary in the fall. "For me, it was a no-brainer," he said. "We'd probably be saving anyway, but this provides a much better avenue." 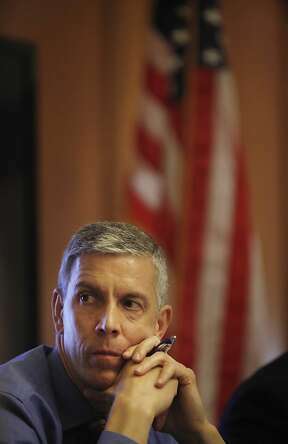 Education Secretary Arne Duncan hears about Kindergarten to College. For some families, the Kindergarten to College program has done more than start a nest-egg students can use for the ever-rising costs of higher education. It's transformed the way they think about their children's future. "It changed the dialogue in our house," said Michael Lan, whose 6-year-old daughter, Caitlyn, will be entering first grade at Lawton Alternative School. "We always intended for our girls to go to college, but it used to be on the back burner and now it's front and center. It sends a message to the next generation. We have to do this together." But if creating a generation of college-bound students needs a communal effort, it's going to take a community of people who are familiar with financial management, according to various members of the panel. And it's precisely that type of community that these programs can foster, said Robert Annibale, global director of microfinance and community development for Citibank, who manages the college accounts for the city. "This is not just about college education - this is about financial inclusion," he said." Lots of parents who bring their children in don't even have bank accounts themselves." Duncan sat quietly through most of the meeting, nodding occasionally and taking notes as the finer points of the program were detailed. He'll be bringing his recommendations back to President Obama, who has called a college education a "prerequisite to success." The challenge now will be to figure out how to expand the reach of the program, said San Francisco Treasurer Jose Cisneros. "We're not stopping here. We have 12 percent saving now, but we have a long way to go," he said. "Let's get it to 50 percent. Let's go well beyond 50 percent."